The next-gen version will run at 1080p, use the PS4's trackpad, and also feature a stereoscopic 3D mode. Every new console generation brings a bevy of beautiful games. Normally, these games come from big publishers with hundreds of millions of dollars to burn, but the Finnish indie devs at Frozenbyte think that its puzzle platformer Trine 2 will fit right in, so it's getting released on the upcoming Playstation 4, along with a host of extras. 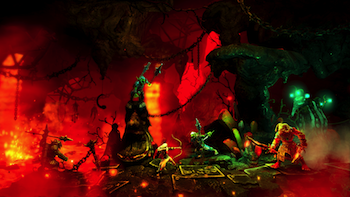 Trine 2: The Complete Story will include all the content in the original game and the Goblin Menace expansion pack. Those gorgeous graphics will be running at 1080p and a full 60fps. Just like before, it will support both online and local co-op for up to three players, and it will even make use of the PS4's trackpad. Frozenbyte's even adding stereoscopic 3D support, which should look pretty amazing if you've got the gear for it. For those unfamiliar with the franchise, Trine 2 is a sidescrolling platformer with a heavy focus on physics. You have three heroes to select, each with their own unique set of skills, with the twist being that you can swap between them on the fly. The impressive physics engine works with fire, water and gravity to create both interesting sets of puzzles and engaging combat. And yes, it really does look that good. Frozenbyte hopes to have Trine 2 ready in time to launch on the Playstation 4 when it goes live on November 15th.